Lieutenant General Nadeem Ahmed (Retired) has extensive experience comprising; Military, Development Sector (especially Disaster Risk Management) and Petroleum Industry spanning well over 4 decades. Within the DRM sector he has unique exposure of managing large-scale natural disasters and complex emergencies through all its phases including prevention/mitigation and preparedness in the pre-disaster stage and response and rehabilitation/reconstruction in post-disaster stage. He served in the military for almost forty years and held various command and staff appointments, including the command of a strike Corps. Since April 2018. Appointed as the CEO of the National Disaster Risk Management Fund , registered under Section 42 of the Companies Act, to provide funding to government and non-government entities, in undertaking risk reduction activities, against natural calamities and climate induced risks, to make Pakistan resilient against disasters. As Managing Director/CEO of Mari Petroleum Company, oversaw successful transition of the Company from a cost-plus-fixed-return based pricing model to an international-crude-oil-price linked market based model, and introduced numerous reforms in the process to transform the Company into a target driven, competitive and vibrant organization. He served as a Special Advisor to UN, World Food Programme (WFP) Pakistan in managing assistance to the Internally Displaced Persons (IDPs) of Federally Administered Tribal Areas. Also advised the World Bank in the development/formulation of Disaster Recovery Framework Guide, for WB’s Global Facility for Disaster Reduction and Recovery (GFDRR), European Union (EU) and the United Nations Development Program (UNDP). As Chairman of the National Disaster Management Authority (NDMA), led his team in responding to a number of disasters, including the Hunza landslide and Attabad Lake crisis, Cyclone PHET, Air Blue crash in Islamabad, evacuation of 250 stranded Pakistani students from the crisis-stricken Country of Kyrgyzstan, and the massive floods in 2010 that left vast regions of Pakistan devastated, affecting over 20 million people. Headed a Special Support Group (SSG) for Internally Displaced Persons (IDPs) to support efforts of the Provincial Government and the international humanitarian community for assisting people displaced by the fighting in Swat region of KPK and FATA, followed by safe, voluntary, assisted and sustainable return of over 2 million IDP within a short period of 6 months. As Deputy Chairman of Earthquake Reconstruction & Rehabilitation Authority (ERRA), he strategized and supervised the recovery, rehabilitation and reconstruction of the earthquake-affected regions, spanning over 30,000 kilometres and affecting 3.5 million people, involving a financial overlay of US$ 3.5 billion. The program is now considered to the one of the successful reconstruction programs in the world. Following the 2005 earthquake, as Chief Military Coordinator at the Federal Relief Commission, supervised and implemented the earthquake relief operations for both civil and military agencies in close synchronization with UN, Donors, INGOs, local NGOs and Foreign Militaries involving an outlay of US$ 2.5 billion. 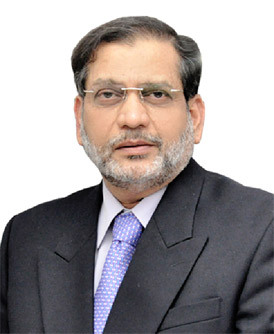 He has extensively spoken at places like the UN General Assembly and in numerous other conferences, seminars and workshops in Pakistan, UAE, Switzerland, Belgium, United Kingdom, United States, Japan, China, Denmark, Australia, Nepal, KSA and Thailand on all aspects of Disaster Management in both natural disasters and complex emergencies. Military Awards Hilal-e-Imtiaz and Tamgha-e-Bisalat for outstanding performance during the military service. Sitara-e-Esar by the President of Pakistan in recognition of outstanding service to humanity. UN Habitat Scroll of Honour at The Hague, Netherlands, in recognition of outstanding leadership and compassion in the face of calamity while helping millions of affected people. Honorary Doctorate from the University of Huddersfield, UK in recognition of exceptional work in the field of Disaster Management. Shah-e-Hamadan Gold Medal by Azad Kashmir Government in recognition of outstanding service to humanity. Best CEO of Oil & Gas Company consecutively for two years from CEO Club Pakistan. National Excellence Award by National Disaster Management Authority in recognition of services and contributions rendered in the field of Disaster Management in Pakistan.